The Sensaphone Express II has built-in features to monitor AC power and high level sound. It also includes 8 universal inputs for sensors, configurable as dry contact, pulse count, 0-5V or 4-20mA analog, or temperature. Optional input and output cards are available to add up to 32 additional input or output channels. The unit can use 2.8K or 10K thermistors for a potential temperature sensing range of -80F to 300F. 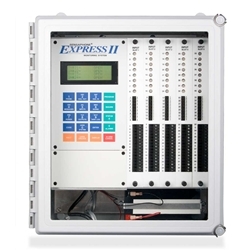 The Express II comes standard in a NEMA-4X fiberglass enclosure. The Express II can dial up to 48 phone numbers with your own voice-recorded alarm messages if there's a problem. Those numbers can be managed as customizable lists for day/night/weekend setup. You may call in to the unit at any time for a status report. The Express II has an integrated keypad and a built-in microphone for sound monitoring. Each input has a corresponding LED that indicates alarm and acknowledgment status. Additionally, the Express II has an LCD display that lists information about the current system status and input/output status. All Sensaphone dialer have non-volatile memory which protects the system memory even during loss of both AC power and battery.